10 weeks to go until my due date! I’m at the point now that I can’t wait, I am ready to meet her! The pregnancy is still going well, minus lower back pain (and sciatica) and heartburn. I forgot how bad the heartburn gets in the 3rd trimester, the only thing that helps is Tums. I’ve been going to my chiropractor almost every week to help with my sciatica. He tried a new treatment on my last visit and it seemed to help a lot. He had me lay on 2 blocks with my lower back, the goal was to push my pelvis back together to relieve pressure on my sciatic nerve and I think it did what it was supposed to. I’ve gained 18 lbs so far (3 lbs more than last pregnancy at this time). Total gain last time was 24 lbs, so hopefully I come in close this time around. Ethan is almost fully potty trained. He has an accident probably every other day but is doing really well overall. I was surprised at how quickly he got the hang of it. We did have a set back last weekend when we went out of town. He had nonstop accidents all weekend, but has been back to his good habits all of this week now that we’re back in our routine. The hardest part for kids (I’ve learned most kids) about potty training is going #2. They hold it and are afraid to go, some will only go at home. After the first few very scary times, Ethan’s (for the most part) got the hang of that part too. My personal struggle with the potty training is public restrooms. I’m a bit of a germa-phobe and when he tells me he has to go potty while we are out, I start freaking out. Without fail he touches the toilet with his hands and legs, shorts and underwear touch the floor :/. The seat covers just don’t work with such a little bottom, and one toilet we went to was far too big for him to sit. I ended up holding him over the toilet and he was able to go. I found a potty protecter online that I’m going to purchase that covers the entire seat. I hope it works well because it’s going to be too much for me to handle otherwise. Here are a couple of cute Ethan comments in the past couple of weeks. We have been using 1, 2, 3 magic. Last night Jarrod said “1”, then Ethan said “don’t count”, Jarrod said “2” Ethan said “don’t count dad”. We struggled to keep a straight face through that one. I ask him a million questions about his day when I pick him up from school and the last couple of times he has told me either to “stop talking” or to “let me talk mom”. For some reason the other funny sayings are escaping me, there are loads of them! I’ll post more next blog. I’ve still been having fun with Ethan’s Planet Box lunch. 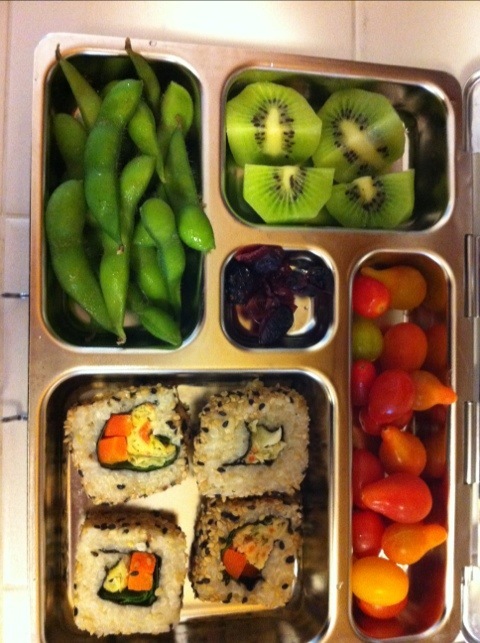 Here’s a picture of one his lunches from last week. 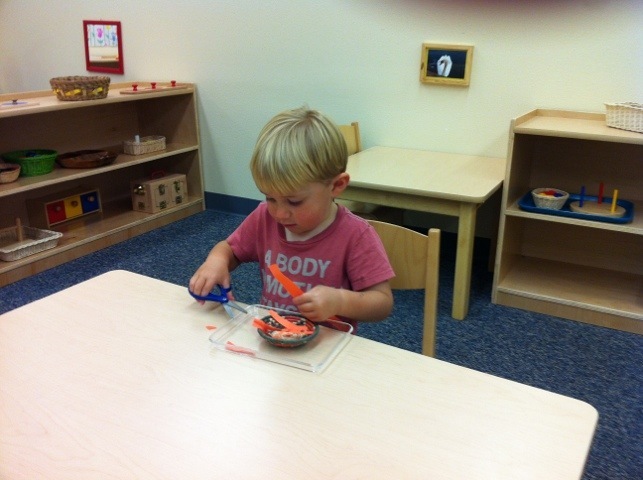 I also went to his open house at school, and here’s a picture of him doing one of his jobs, “cutting”. Today marks the beginning of my third trimester. I’ve been very fortunate (knock on wood) to have an uneventful and boring pregnancy so far. I’ve been feeling pretty good, minus some lower back pain. I’ve had no food cravings, a slight aversion to chicken and meat in general, and have had a lot of energy since a couple of weeks into my second trimester. With the third trimester here, I can tell that I’m starting to slow down a bit down and am really tired by the time the evening rolls around. The last 3 weeks I’ve been gaining about 2 pounds a week. My belly is starting to get really big! I’ve gained 16 pounds so far. Hopefully I’ll resume the 1 pound a week weight gain soon. In Ethan news, he has been potty training since Thursday. He told his teacher on Thursday he didn’t want to wear his diaper, so he (for the most part) hasn’t been wearing one since then. He’s had lots of accidents but at least we are making strides in the right direction and hopefully he will be potty trained by the time Stella arrives. Yesterday Ethan started to use the pedals on his bike rather than scooting with his feet on the ground. We have been working towards that for a while so we were pretty excited! He also used scissors at school and brought home some of his “cutting work” about a week ago. His teacher said that he is enjoying cutting carrots and other vegetables with a vegetable chopper. We need to get one for the house so he can help us prepare dinner. Poor little guy is still suffering from side effects of when he had hand, food and mouth disease. One of his big toes, and both of his thumbnails are falling off. I read online that with the most recent strain that has been going around it’s fairly common. I pray that he doesn’t lose anymore nails, it seems so painful and looks terrible! 2 weeks ago we went to Fresno so daddy could go turkey hunting. Ethan got to spend lots of quality time with Grandma Karen and Grandpa Bill. He went swimming (well sort of) in their pool and they took him fishing. As Grandma said they didn’t catch any fish, but they made lots of memories. Last weekend we went to Sacramento and the Bay Area for a wedding. Ethan did really well on the “big Jetblue airplane” and had a really fun time with Granny, Grandpa Chuck and cousin Emma. They went to the zoo, the pond (which had ducks) and Ethan went with Granny to her school. In Mrs. Marian’s class they did a lesson on the different continents, and focused on Africa. He is a smart little cookie and picks everything up like a sponge. Lions are his favorite animals and he already knew that they live in Africa and that they eat antelope, but when we got back from the Bay Area he told us that they are carnivore’s. Ethan has still been having aggressive behavior at times which includes hitting and throwing toys. He has had to sit away from the other kids at school from time to time when he’s having bouts of his aggression or just won’t keep his hands to himself. I’m not quite sure what to do about it, but we’ve been trying to discipline constantly, with time outs, telling him to be gentle and taking things away from him that he wants. I’m hoping that it’s just part of being two and that he will outgrow it soon. He’s also perfected the terrible 2 tantrum. Often when he’s having his tantrum is when he’s the most aggressive. As aggressive as he can be, he is also a very sweet boy. His new favorite thing is to say hello to everyone he sees. He is also really gentle with babies and toddlers that are smaller than him. He is also pretty good at sharing with his toys.